Luke, I am your father. 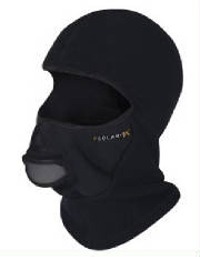 This Darth Vader looking setup is a basic medium-weight Polartec fleece balaclava with a unique feature: the mouth opening is covered by a little heat exchanger thingy. The thingy purports to store warmth from your exhaled breath and use it to warm incoming air. Benefits of the thingy are that it warms your core and humidifies somewhat. I used it last winter on some below-zero cold trips, including Denali. It seemed to work, but I'll be the first to admit that I could be imagining. It does impart a "taste" to the air you breathe that some people might find off-putting, and some might find it claustrophobic because of the thingy covering the mouth. Bottom line: no scientific but lots of anecdotal evidence that it works; but then, there's lots of anecdotal evidence for alien abductions too. Sorry, you'll just have to try this one yourself. The good news is it's a high-quality 'clava and the thingy is removable.